Volunteering is a way to assist others while gaining new skills and experiences. We recognize that the reason for volunteering differs for every individual. Below are a few reasons why volunteering at the Raider Food Pantry can be rewarding! Contact foodpantry@wright.edu if you are interested in volunteering. You will be asked to complete a Volunteer Interest Form and complete the Volunteer Orientation and Training Session. 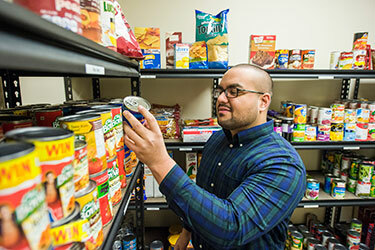 Intake volunteers assist pantry clients by helping them complete the required documentation, providing referrals, guiding them through the shopping room, and stocking the pantry as needed. Intake volunteers also assist with data entry. This opportunity is great for someone with excellent customer service, computer and communication skills! Lead volunteers are individuals who have served in the capacity of an intake volunteer for at least one semester. They assist the Food Pantry Coordinator with training new volunteers. Lead volunteers will also assist in planning events on campus such as donation drives, fundraisers and may staff an informational table at on-campus fairs. Please list days and hours you would like to volunteer with the frequency of your flexibility (Once a week, twice a week, once a month or twice a month).